Securityman is on a run and releasing some great new cctv products; which now includes the all new ClockCamDVR! The Securityman ClockCamDVR is designed for users who want to discreetly monitor their visitors, strangers, babysitters, and business activities. 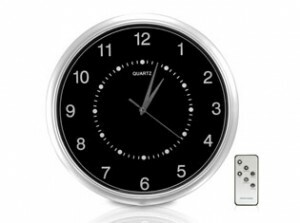 It includes a hidden camera in a functional wall clock and it records to micro SD (not included). The Securityman ClockCamDVR security camera can be installed in seconds and it is a hassle free solution that doesn’t need to run long video cables. Simply mount the clock DVR (Digital Video Recorder) at a desired location, connect the power, and you’re ready to record. It is a perfect security product for homes and small businesses.